Taste test: These chips were crisp and kettle-cooked, with a pretty good crunch. Some of the chips were brown on some edges. They had a tasty and fairly strong jalapeno flavor, with a mid-level heat, not all that hot at first, but the heat grew gradually to a reasonably hot level. 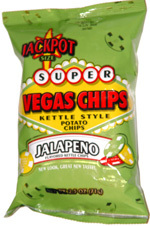 Overall, some good jalapeno chips.